The full Square Enix Presents Day Two discussion. 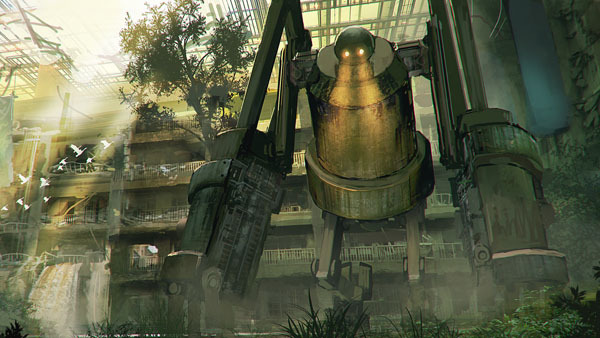 NieR New Project producer Yosuke Saito and director Yoko Taro sat down with Square Enix Presents at E3 to discuss the newly announced followup to 2010’s NieR. Get the full transcript below. The first NieR came out in 2010, and I don’t think anyone expected a sequel. What made you go back to this IP? Saito: “Yes, I was the producer on the original title that came out five years ago. Yoko-san was also the director on that project. And we have Okabe-san, who was very well accepted for the composition and soundtrack of that game. At the time, we had contacted a company called Cavia for the development of the actual game. The core NieR staff is actually made up of a lot of Dragon Quest staff members who’ve worked with me on previous Dragon Quest titles over the years. It’s basically an action RPG. How does this connect to the original NieR? In addition to yourselves, you’ve got the rest of the Platinum team, Keijii Okabe on music, it’s a dream team of talent. How did you pull together that kind of team? Speaking of which, I understand you guys brought a video message from some staff who couldn’t be here today. The NieR series has always had a lot of strong themes and a very deep backstory. Where will this one go in terms of that? Yeah, I remember the ending to the last one. The trailer looks to feature a ruined, lonely world. And you have this female protagonist. Will she have any relation to the series’ previous characters? What then, in your mindset, makes this set in the NieR universe? What gives it that feel? How much direction would you say you’re providing on the character designs? Is there anything you can give us about the trailer cliffhanger? Words are very powerful within NieR. It seems there are a lot of happy coincidences with NieR. It’s amazing the amount of depth that comes out when you don’t try. What is Platinum Games bringing to the game’s combat? Is the balance between Platinum Games’ action strengths and NieR something you’re overseeing? Or are you just letting them role with it? The original NieR had a mesh of genres within it. Will the sequel have those kind of curve balls? What can we expect from Okabe on the music? I do hope that kind of thing will come back. Since we were talking about the ending earlier, there was one ending that left the player with a very terrible choice to make. What kind of role will that kind of choice, or player choice in general, play in the game? That’s what people want—to be shocked and taken into a new direction. Is there anything you want to say before we wrap things up? I’m sure they appreciate every word of that. No one expected that to come back. But the reactions were all shock and joy. I think they’ll be fine. I know a lot of female action gamers that can destroy me. Do you have multiple difficulty modes? I don’t want to make that call. But as you said, there are skilled gamers who might want to play on a higher level of difficulty. But then there are some players who will play on easy, if given the option. Saito: “I can’t go into too much detail because it hasn’t been finalized yet, but there may be some kind of system in place of difficulty settings. “I know a lot of people are anticipating this game, but looking at the staff, we have [talented staff list], and they’re all very passion-filled people and extremely talented, so honestly, I might be the most giddy of the development staff. Because thinking of the talent we have on board, I’m just wondering what kind of amazing game we can put out. Last request from me. If you do a soundtrack and art books, make sure we get them in the west.